Fitness is big in Santa Monica. The beach and excellent Southern California environment is ideal for showing off well-toned bodies year around. In order to create and maintain a body that can impress others and build self-confidence, you need to make sure your fitness routine is as optimal as it can be. Signs that your fitness routine can use enhancement can include overtraining, lack of improvement, boredom, and excessive fatigue. Though, in most cases any routine can be improved by doing three important things. The first step would be to adjust and frequently change your exercises. By making changes to your movements as well as the intensity of the weights and reps, two important factors will be enhanced. A higher intensity means you will stimulate more and deeper muscle fibers, thus creating more and denser muscle. If you get too used to a routine and set weights and reps, the muscles will adapt to it and stop improving. The bigger or stronger your muscles get, the more volume and intensity is required for continual gains. Changing the types of exercises is important as well, mainly due to keeping yourself motivated. Different movements will keep your mind focused on the exercise which will result in a more satisfying workout. The second step is to eat right. Building muscle and losing weight doesn’t rely entirely upon exercise, the food you take in is equally as important. 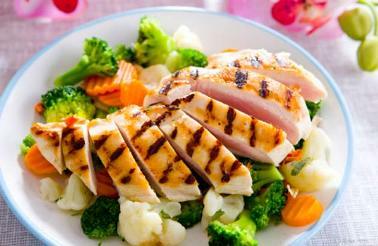 The key to building muscle and burning fat is to keep your body fueled with healthy foods. Carbohydrates are used to provide the initial energy to the body, while proteins are needed for muscle repair and building. Of course you will want to eat fruits and vegetables, as well as drink plenty of water – at least 100oz. per day. The third step is to make sure you are getting enough quality sleep. The exercises in your routine are actually designed to break down your muscles in order for your body to repair and strengthen them. This process occurs mostly while you’re sleeping. Those of you that get as little as 6 hours of sleep do not give their bodies enough time to recover properly. This will result in excessive fatigue and lack of motivation. It’s recommended that you sleep at least 7-8 hours a night. It is also completely normal to sleep 9-10 hours when performing intense workouts. The best way to optimize your fitness routine is to find the right personal trainer. Whether you are a homemaker, business owner, executive, celebrity or athlete, we are the right match for your fitness needs. Our personal trainers can help you get into top shape in minimum time. We specialize in creating fitness routines customized especially for you. Sample before and afters, click to see all 8 pages! Build a beach-ready body by training with Mr. America Jason Kozma! If you’re looking for the best personal trainer for your needs, Jason is the obvious choice. Jason can train you to create the body you’ve always dreamed of by providing you with professional advice and customized workouts created specifically for your needs. Below are a few muscle building tips and a sample exercise by Jason himself. These tips and the exercise will give you a little insight to the fitness knowledge and experience he has accumulated over time. Even seasoned exercisers tend to overlook this tip, but when you’re working with Jason he’ll make sure your muscles are properly prepared for the workout ahead. Warming-up and stretching will benefit you by reducing soreness, decreasing the risk of injury, and increasing blood flow. Cooling down can be done after working out to help reduce soreness by removing lactic acid. Resting is just as important as the workout itself. No good personal trainer will ever tell you not to take a day off. Overworking your muscles can have many negative effects such as injury or muscle breakdown. If you are a beginner, it is recommended that you take a day off in-between your first few workouts or help prevent that overwhelming soreness. After a week or two, you’ll be able to exercise on consecutive days. Be sure to get the recommended eight hours of sleep per night as well since this is the time the body is repairing the muscle tissues you tore while working out. Proper form is necessary for getting the most out of your workouts. One of the best benefits of having a personal trainer is checking the client’s form. Improper form will result in definite injury and zero results, so if you have any questions about how to perform a specific exercise then don’t hesitate to ask Jason. If you’re training under Jason, you’ll notice a large variety of exercises in your routine. Even if your only goal is a six pack or large biceps, don’t target only these muscles alone. Imagine if you a large biceps, but the rest of your body looked untrained. Your goal should be to have a well-balanced muscular body, which looks great from any angle and is much more impressive that just a six pack or large biceps. Jason will also mix up your routine so that the muscles don’t get used to a specific workout. Here’s a free basic workout for females to lose inches. Don’t you deserve the best? Call now to schedule an appointment so that you can get started working on that muscular beach body that will soon be yours.